Kabul hosted the sixth round of this season’s mixed martial arts (MMA) tournament on Friday evening with 10 fighters from Afghanistan, Iran and Pakistan. The events of the tournament, nicknamed Fight Night, are held once in every two months. The first fight was between Toryalai Malikzada from Afghanistan and Porya Gulpur from Iran in which the Afghan fighter beat his Iranian rival in the third round on points. 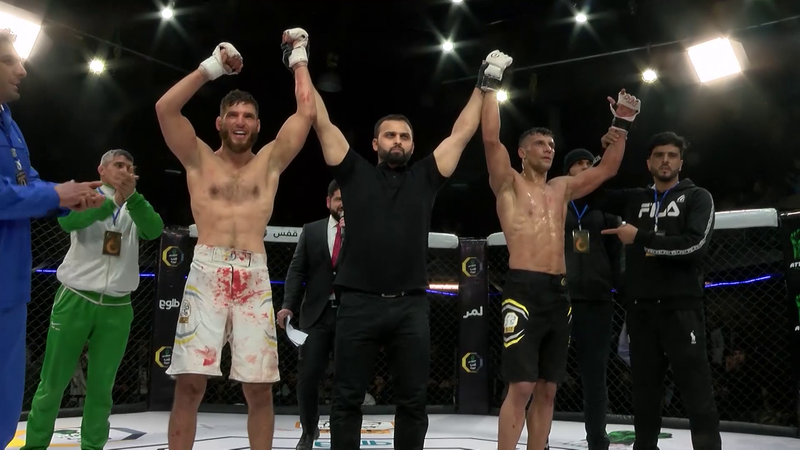 The second fight was between Afghan MMA fighters Sayedkheli and Samiullah Rahimi in which the two were announced winners by getting equal points in three rounds. In the third fight, Abdulwadood Matin from Kabul and Shah Nawaz from Pakistan went into the cage which ultimately ended with defeat of the Pakistani fighter in a knockout in the second round. The fourth fight was between Afghan fighters Esmatullah Adel and Mirbaba Naderi in which Adel lost the fight in the second round as he was knocked out by his rival. The last and the most important fight was between Husain Bakhsh Safari and Imran Tarakhail in which Safari won the Snow Leopard Fighting Championship (SLFC) championship by defeating his rival in five rounds on points. The competition was organized by MOBY Group in association with the Snow Leopard Fighting Championship (SLFC) to promote mixed martial arts and introduce the sport to the people. Afghan MMA fighter Arash Sayedkhaili (left) celebrating his win against Sameullah Rahimi (right). Eight Afghan, one Pakistani and one Iranian fighters participated in the sixth round of this season’s MMA tournament.